The Jewish People certainly do not lack heroes. Through out our existence many have given their lives for the betterment of others. Most of these people are not known. In every age, in every country, there have been Jews that have risked their lives, and even been murdered in order to preserve and protect the Jewish nation. Elie Cohn was one of these. His contribution to modern Israel gave the Israelis the quick defeat of the Syrian forces in the Golan Heights, during the Six Day War. Elie was a spy. Elie Cohn was born in Alexandria, Egypt in 1924. His parents had emigrated from Haleb, Syria before he was born and settled in the Jewish Ghetto in Alexandria. An intelligent boy, he learned Hebrew and French. He enrolled in the Engineering curriculum in the Farouk University. However in 1952, two years into his studies, the Moslem Brotherhood began demonstrations against the British, and of course Jews, and his college education came to a halt. In 1954, many of his friends were implicated in a spy ring, most were given jail sentences, some were executed. Elie was arrested but subsequently acquitted. He felt that this was now the time to leave Egypt and join his family who had immigrated to Israel in 1948. In 1959, he met his wife, Nadia, a Jewess of Iraqi descent and they were subsequently married. Working as a clerk to support his family he was approached by the Israeli Secrect Service to work for them, but he refused. Afterwards, he lost his job and agreed to try his luck in the secret service. After his brief training period, Elie was given a new identity. He became Kamel Abin Tabet, a Lebanese born Syrian whose father was a textile merchant who emigrated to Argentina. As a wealthy man, he was to infiltrate the Iraqi community in Buenos Aries. Being an affluent and handsome newcomer, he was welcomed into the community and soon made friends amongst the influential personalities. 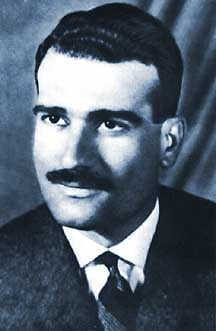 He was known as a Syrian patriot and became close to the military attaches, diplomats, and newspapermen. Syria had been through numerous military coups. The Ba'ath party was now in its formation. The Ba'ath Party was a Syrian concept of Socialism mixed with Islam. At this time the United Arab Republic, the UAR, was an attempt to unite the Arab countries, but only contained Egypt and Syria. The Syrians did not like being subservient to the Egyptians. Elie courted the Ba'ath Party representatives in Buenos Aires. Eventually the Ba'ath Party came to power. After solidifying his contacts in Argentina, he left to return to his "home land". He brought with him a radio transmitter and rented a magnificent villa opposite the Syrian government complex. With his good connections from Argentina, he was able to work his way into the internal military and political hierarchy. He soon became friends with all of the top ministers and generals. In his villa, he hosted parties that were attended by only the top echelon of the Syrian government. In the relaxing atmosphere of Elie's villa, with plenty of the best liquor, food and attractive girls, the government mininsters felt at ease meeting and speaking In fact, at his parties, many of the top decisions in the government were made. Of course Elie was privy to all of these discussions. Many times, trusted friends of high government and military rank found solace in Elie's house from the rigors of their work. Elie welcomed his friends with his open liquor cabinet, always well stocked, and food. He had extra bedrooms and girls were on call to soothe a tired government or military official who needed some relief. So trusted was Elie, that he was asked to censor data for external broadcast. He was taken on tours of the Golan Heights and shown plans that Syria had for diverting the water that came to the Baniyas, a river in Northern Israel. This was being constructed by a Saudi Arabian construction company headed by an Arab by the name of Bin Laden. In addition to this, all of the military positions were known to him. As a personal friend of the Syrian President, he learned of the newest decisions and deployments of military forces. Each day, Elie would use his secret radio transmitter to broadcast his information to Tel Aviv. The Israelis took advantage of a minor border incident to destroy the Syrian water diversion plan with pin point strikes. The Syrians were outraged, how could they know exactly the locations to strike. The Syrians soon became alerted, that the Israeli Arabic news service was broadcasting the latest decisions even before the local news services had the stories. They became convinced that there was a spy in the inner most circle. In a short time Elie was discovered to be a spy. A shock wave rolled through all of Damascus. His friends could not believe that their most trusted friend was an Israeli agent. He was tortured and eventually was brought to trial together with all of those high ranking ministers and generals that leaked to him information. He was sentenced to death and although the world brought pressure on the Syrian government to annul the decree, Elie was hung on May 18, 1965, leaving a wife and three children. Due to Elie's bravery, many military secrets were transferred to the Israelis. This information was used during the Six Day War to enable the Israelis to take the Golan Heights with a minimum of casualties. Elie gave his life to insure the survival of the Jewish people. May his memory be blessed.